This topic contains 16 replies, has 4 voices, and was last updated by Heath 5 months, 3 weeks ago. Well, it’s a start anyway! If it had been a direct change from the big to small hole – if layer 16 had been like layer 20 – it would have required supports. Supports are not a huge ordeal and I have my support settings dialed in so they’re not too difficult to remove. But, they can still be a pain. But the transition steps at layer 16 and 18 make supports unnecessary. By designing in those straight edges, that creates bridging rather than a circle printed in air (since the blue perimeter lines will be printed first). That amount of bridging is so small and insignificant that Simplify3D doesn’t even recognize it as bridging. The printer handles it no problem. No supports are needed. It’s such a small thing, but it really speaks to the quality of design and the thought and time that went into every part. And I learned something about design just by slicing this one part! Incredible job, Ryan. Thanks. I can’t take all the credit though. I only used to do one transition (your layer 16) at some point I saw a video and the guy did a second one (your layer 18). That made all the difference. It all really stems from my dislike of frivolous support. 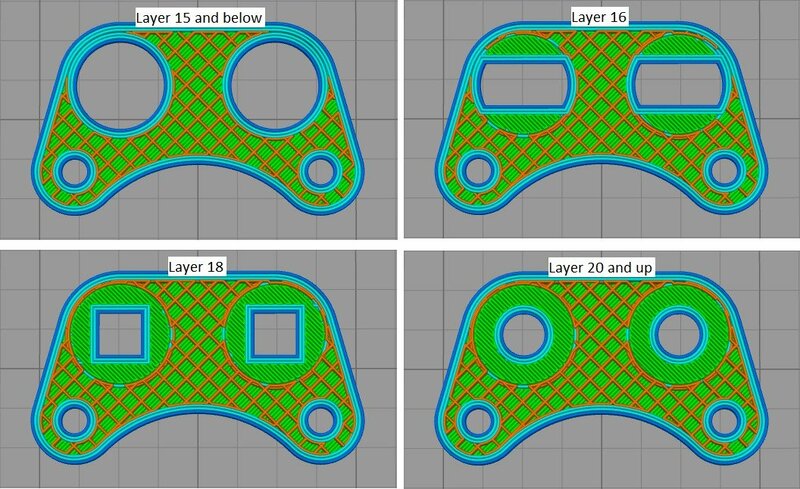 If you know your part is going to be made on a 3D printer it should be designed as such. It does take a single counter sunk hole (1 feature) to a 3 step process though. Doing something once in CAD is better than every single person having to remove supports though. For the part you have a picture of, the previous iteration of the LR2 design did not work as a whole but I had a really elegant 4 part solution to the X motor assembly. 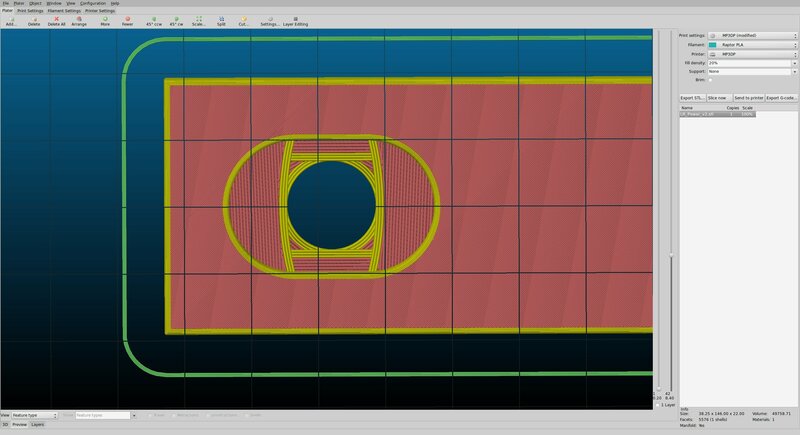 Here is what it looks like in CAD, you just have to make sure the cuts are at least a layer deep each, so I use 0.4mm. Edges tangent to the hole. I can’t wait to see what you think of the vac mount….On my printer it works with no screws. Oh, and always do at least a 1 layer high chamfer on all bed side surfaces to minimize elephant foot screwing up the fit. That’s very helpful insight, actually. I’ve traced a few of your things for various reasons, and I have adopted that chamfer, but I wasn’t really sure why. It makes the parts feel more professional though. 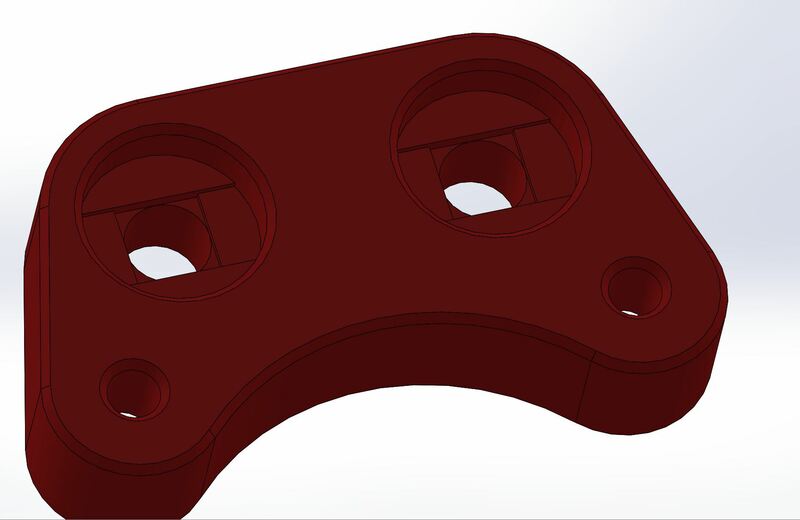 Here is what it looks like in CAD, you just have to make sure the cuts are at least a layer deep each, so I use 0.4mm. So if you’re slicing with 0.254 or 0.3 or whatever, at least one layer will be in that in between section? That makes sense. That bottom chamfer I tend do do either 0.8mm try to get two layers in there. For the overhang thing one layer is good. If I was designing for myself the number would be exact but trying to get things right for 0.2mm-1.2mm nozzles is not always easy. I have wanted to make a page for this stuff. A few more. Always round all sharp XY plane corners, speeds up print times and minimized ghosting. 45-50 degree overhangs are okay on a single face, less if it is more than one face. 0.2mm is a pretty solid tolerance number to use, as in holes print about that much smaller, and it even works well for part to part fit. Emboss and deboss are pretty good looking at 0.25mm, deboss is harder to edit out of an STL. Sorry Heath, you can have your thread back. 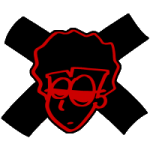 Welcome to the Crew, and our tangents. That subtle curve is causing the tiny lines next to it, you would probably be better to use straight ones so all the lines bridge all the way. Some slicers also have a bridging overlap setting. That really helps as well. That subtle curve is causing the tiny lines next to it, you would probably be better not use straight ones so all the lines bridge all the way. Some slicers also have a bridging overlap setting. That really helps as well. It’s like, you knew where it would be ugly! I am either psychic or I have ESPN…can’t remember which. 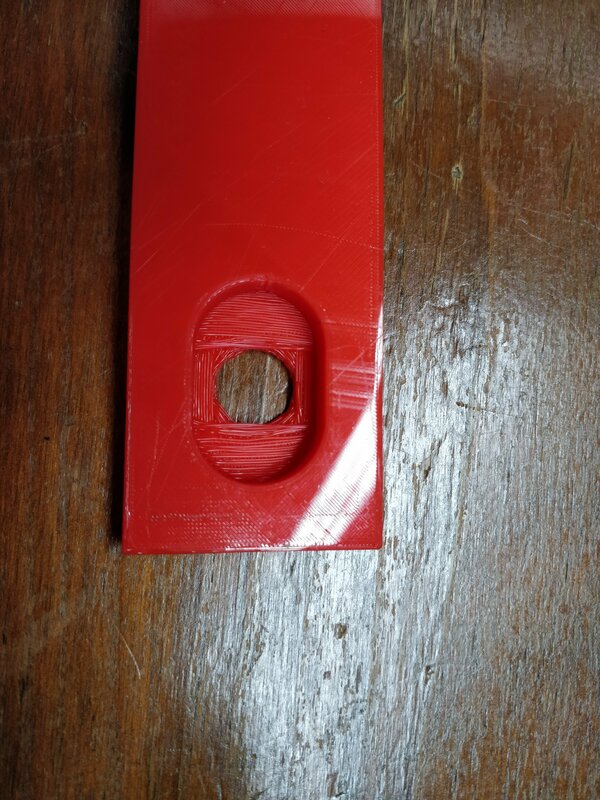 I normally put a one layer thick plane under a hole so that it’s enough to support the circle above, but you can push a bolt right through, just curious if that would work for this application? I just built an RC two track vehicle that had the holes supported like that. I hadn’t seen that before. I ended up drilling instead. 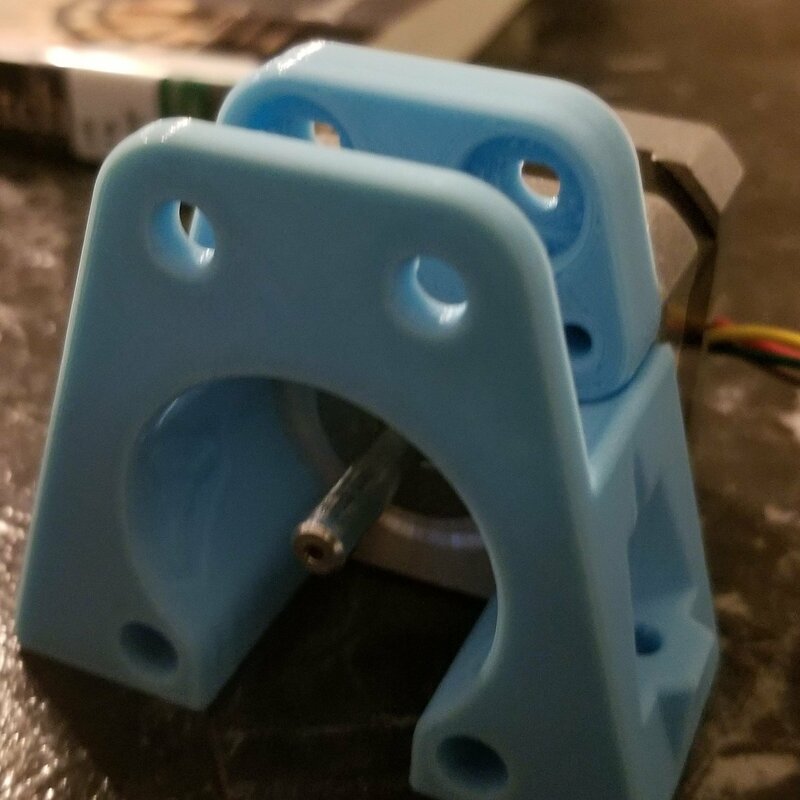 On my model, it’s for a switch and that surface is actually under the switch, so it doesn’t matter. It’s actuall a pretty big gap too, the hole is 10mm IIRC. I have wanted to make a page for this stuff. You should. I love reading Andy Shen’s web site (shendrones.com) and reading about his design approaches, techniques, failures and successes, etc. I’d love to read more from you too. I got the idea from this video: https://youtu.be/IVtqAn4oDDE , I quite like this method because its pretty quick to model, good to keep in your back pocket. I love reading Andy Shen’s web site (shendrones.com) and reading about his design approaches, techniques, failures and successes, etc. Wow, his write ups are awesome! I am not actually sure how he does that. He must just take notes as he goes, and screen shots. For me it is hard to know when it is a pivotal moment until it is done. I really like this approach and would love to try it. I need to do make something new. To try that out…..even more fun maybe dig through the CAD archives for the MPCNC I have many many designs that have not worked for one reason or another. YES that is the exact video! 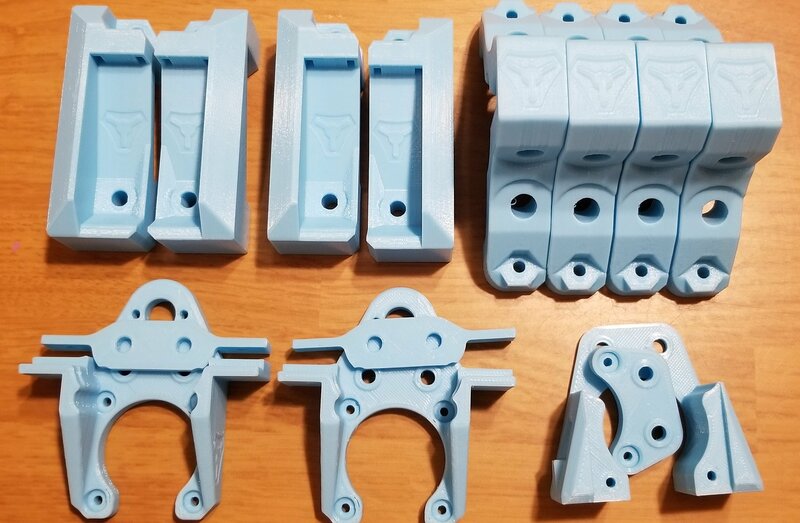 Slowly making progress on the printed parts. I still have almost all the non-printed parts to aquire.